An American genus, of about 6 species. Type species: Strophostyles angulosa Ell. Leaflets mainly lobed, 1' - 2' long; pod 2'-3' long; root annual. Leaflets mainly entire, 1/2'-1 1/2' long; pod 1' - 2' long. Flowers several, about 6" long; root perennial. Flowers few, about 3" long; root annual. Phaseolus helvolus L. Sp. Pl. 724. 1753. Phaseolus angulosus Ort. Nov. Pl. 24. 1797. Phaseolus diversifolius Pers. Syn. 2: 296. 1807. Strophostyles angulosa Ell. Bot. S. C. 2: 229. 1822. S. helvola Britton; Britt. & Brown, 111. Fl. 2: 338. 1897. Prostrate or low-twining, rather rough-pubescent, branched at the base, 2°-8° long, rarely erect and 10'-2o' high. Root annual; stipules narrowly lanceolate, 1"-2" long; leaflets broadly ovate, obtuse or acute at the apex, rounded at the base, thickish, generally more or less obtusely lobed, sometimes entire, 1'-2' long, the lower ones often inequilateral; peduncles axillary, exceeding the petioles; flowers 3-10, sessile, capitate; corolla greenish-purple, 4"-6" long; keel slender, curved; pod sessile, linear, nearly terete, slightly pubescent, 2'-3' long; seeds oblong, pubescent, 2 1/2"-3 1/2" long. In sandy soil, Quebec to Massachusetts, Florida, Ontario, South Dakota, Kansas and Texas. July-Oct.
Strophostyles missouriènsis (S. Wats.) 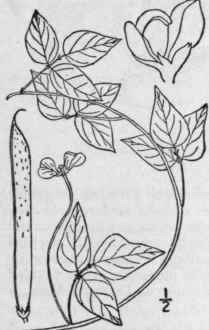 Small, regarded as a variety of this species in our first edition, differs by being a longer vine, climbing over trees and bushes, its leaflets nearly entire and its seeds slightly larger. It ranges from Virginia to Illinois and Kansas. Glycine umbellata Muhl. ; Willd. Sp. Pl. 3: 1058. 1803. 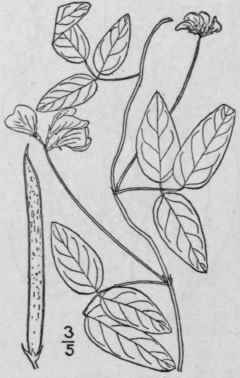 Strophostyles peduncularis Ell. Bot. S. C. 2: 230. 1822. Phaseolus helvolus T. & G. Fl. N. A. 1: 280. 1838. Not L. 1753. Phaseolus umbellatus Britton, Trans. N. Y. Acad. 9: 10. 1889. S. timbellata Britton; Britt. & Brown, 111. Fl. 2: 339. 1907. Root perennial; stems slender, trailing, branching, more or less pubescent with retrorse hairs, 1°-5° long. Stipules ovate-lanceolate, 1"-2" long; leaflets ovate, lanceolate or oblong, obtuse or acutish at the apex, rounded at the base, sparingly pubescent, entire, or rarely with 1 or 2 shallow lobes; peduncles generally much longer than the leaves; flowers several, pink, fading yellowish, capitate-umbellate, about 6" long, similar to those of the preceding species; pedicels 1/2"-1" long; pod linear, straight, little compressed, sessile, 1'-2' long, 2" wide, sparingly pubescent; seeds mealy-pubescent, 1 1/2"-2" long. In sandy soil, Long Island to Florida, Indiana, Arkansas and Texas. July-Sept.